Visit I Should Be Folding Laundry for more You Captures! Wow, that is awesome texture. I love the vivid color, and your reflection. That leaf is such a beautiful color and contrasts so beautifully with the background. What a great photograph! 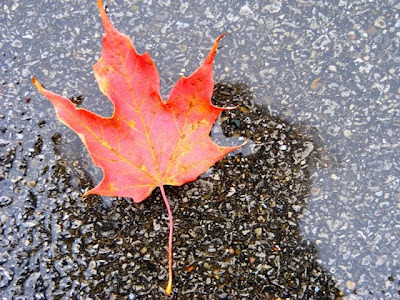 It's funny how something as insignificant as a leaf can become so beautiful if captured just right like you did! Love it! =)There is beauty in everything. that really is a gorgeous shot. i love finding beauty in very simple places. ps. i love your header! I'm a sucker for rainbows. I love your shadow in the shot. very cool effect.